The Chrome UX Report (AKA "CrUX") is a dataset of real user experiences measured by Chrome. 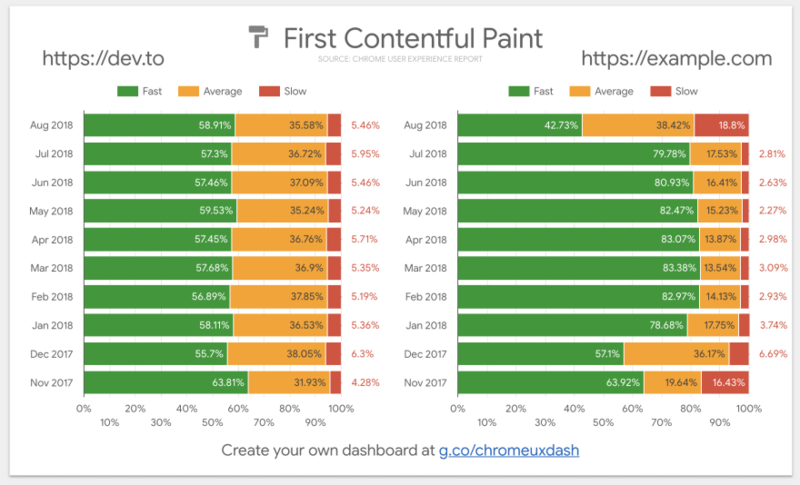 Google releases monthly snapshots of over 4 million origins onto BigQuery with stats on web performance metrics like First Contentful Paint (FCP), DOM Content Loaded (DCL), and First Input Delay (FID). 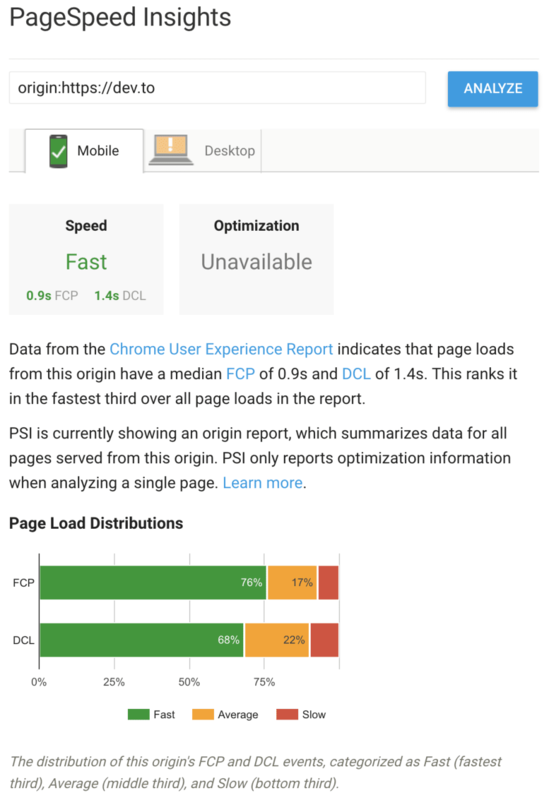 PageSpeed Insights is another tool that integrates with CrUX to provide easy access to origin performance as well as page-specific performance data, in addition to prescriptive information about how to improve the performance of the page. The CrUX datasets have been around and growing since November 2017, so we can even see historical performance data. In this post I walk you through the practical steps of how to use it to get insights into your site's performance and how it stacks up against the competition. Writing a few lines of SQL on BigQuery, we can start extracting insights about UX on the web. The raw data is organized like a histogram, with bins having a start time, end time, and density value. For example, we can query for the percent of "fast" FCP experiences, where "fast" is defined as happening in under a second. The results tell us that during August 2018, users on dev.to experienced a fast FCP about 59% of the time. Not much different, we just add the other origin and group it so we end up with a fast FCP density for each. It turns out that dev.to has a higher density of fast experiences than example.com, whose density is about 43%. 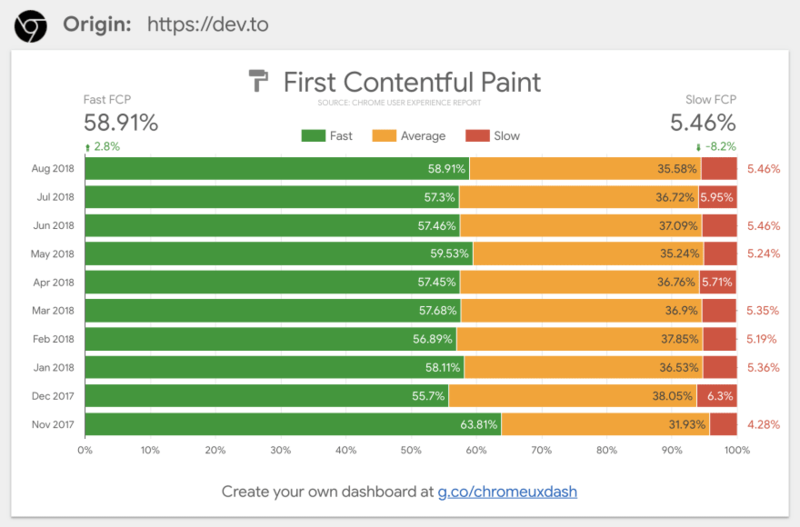 By plotting the results in a chart (BigQuery can export to a Google Sheet for quick analysis), we can see that dev.to performance has been consistently good, but example.com has had a big fluctuation recently that brought it below its usual density of ~80%. Ok but how about a solution without SQL? I hear you. BigQuery is extremely powerful for writing custom queries to slice the data however you need, but using it for the first time can require some configuration and if you query more than 1 TB in a month you may need to pay for the overages. It also requires some experience with SQL, and without base queries to use as a starting point it's easy to get lost. There are a few tools that can help. The first is the CrUX Dashboard. 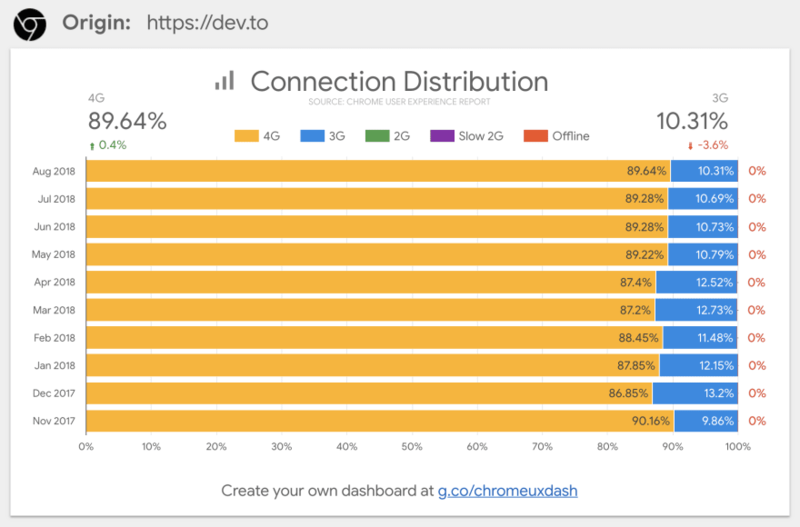 You can build your own dashboard by visiting g.co/chromeuxdash. This will generate a dashboard for you including the FCP distribution over time. No SQL required! 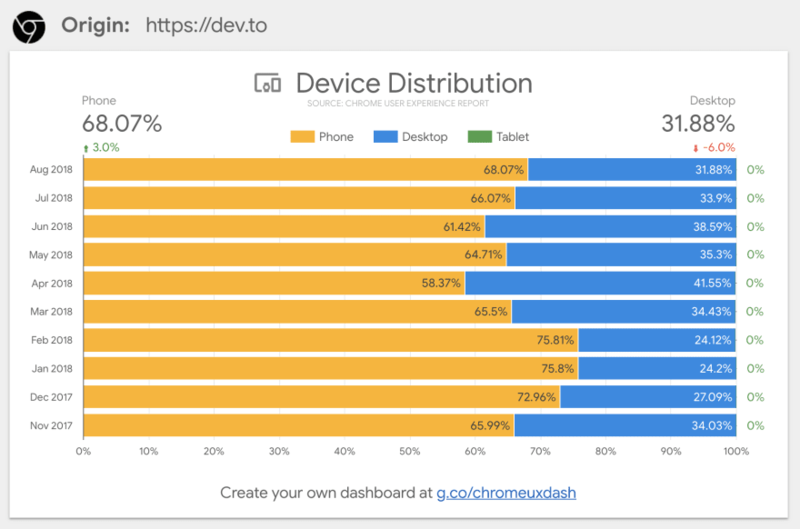 This chart shows that users on dev.to are mostly on their phone and just about never on a tablet. The connection chart shows a 90/10 split between 4G and 3G connection speeds. These classifications are the effective connection type. Meaning that a user on a 4G network experiencing speeds closer to 2G would be classified as 2G. A desktop user on fast WiFi would be classified as 4G. The other cool thing about this dashboard is that it's customized just for you. You can modify it however you want, for example you can add the corresponding chart for example.com to compare stats side-by-side. The dashboard is built with Data Studio, which also has convenient sharing capabilities like access control and embeddability. What's the absolute easiest way to get CrUX data? Also keep in mind that a page that has data for the current 30 day window may not have sufficient data in a future window. 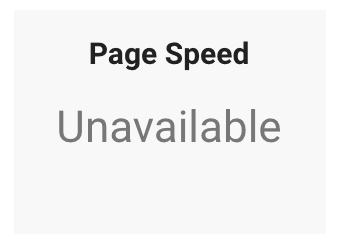 So that link to the PSI data for @ben 's post may have Unavailable speed data in a few months, depending on the page's popularity. The exact threshold is kept secret to avoid saying too much about the unpopularity of pages outside of the CrUX report. How do I get page-level data over time? It's tricky because while PSI provides page-level data, it only gives you the latest 30-day snapshot, not a historical view like on BigQuery. But we can make that work! PSI has an API. We can write a crafty little script that pings that API every day to extract the performance data. Go into the "Tools" menu and select "Script Editor"
From the Apps Script editor give the project a name like "PSI Monitoring", go into the "Resources" menu, select "Advanced Google Services", and click the link to enable services in "Google Cloud Platform API Dashboard"
The script reads the API key that you assigned to the script properties and comes with two origins by default. If you want to change this to URL endpoints, simply omit the origin: prefix to get the specific pages. The script will run each URL through the PSI API for both desktop and mobile and extract the proportion of fast FCP into the sheet (named "Sheet1", so keep any renames in sync). You can test it out by opening the "Select function" menu, selecting "monitor", and clicking the triangular Run button. For your first run, you'll need to authorize the script to run the API. If all goes well, you can open up your sheet to see the results. I've added a header row and formatted the columns (A is a date type, C and D are percentages) for easier reading. From there you can do all of the powerful things Sheets can do, like set up a pivot table or visualize the results. select any hour for the script to run, or leave it on the default "Midnight to 1am"
After saving the trigger, you should be able to return to this sheet on a daily basis to see the latest performance stats for all of the monitored URLs or origins. Just give me something I can clone! Here's the sheet I made. Go to "File > Make a copy..." to clone it. Everything is now set up for you except for the API key property and the daily trigger. Follow the steps above to set those up. You can also clear the old data and overwrite the sample URLs to customize the analysis. Voila! These tools enable developers of all levels of expertise to make use of the dataset. In the future, I hope to see even more ambitious use of the data. For example, what if the tool you use to monitor your site's real user performance could also show you how it compares to your competition? Third party integrations like that could unlock some very powerful use cases to better understand the user experience. I've also written about how we can combine this with other datasets to better understand the state of the web as a whole. For example, I joined CrUX with HTTP Archive data to analyze the real user performance of the top CMSs. The dataset isn't even a year old yet and there's so much potential for it to be a real driver for change for a better user experience! If you want to learn more about CrUX you should read the official developer documentation or watch the State of the Web video I made with more info about how it works. There's also the @ChromeUXReport account that I run if you have any questions. How to have the customized crUX dashboard, clicked the chrome ux dashboard, there I am able to see only the report FCP chart only . Great question. You're right, it's not obvious. I will write up a short guide on how to make a competitive dashboard. You can use this dashboard with competitors! Thank you so much Hulya ...I used your report. It is working good. 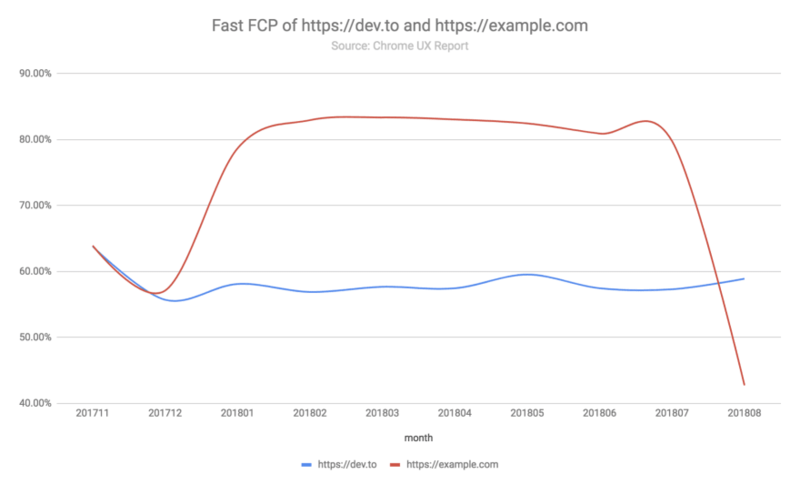 You mention that people should plug their URL into PageSpeed Insights to see if CrUX data is available for the URL, but it's cumbersome to come up with a list of URLs and test each one. Is there a way to get a list of URLs that have data in CrUX for a given domain? To check if a single origin or URL is in CrUX, the PSI web UI is the quickest way. If you have a batch of known URLs you can use a script similar to the PSI Monitoring code to test them all against the PSI API. If you have a batch of known origins, you could write a query against the BigQuery dataset similar to SELECT DISTINCT origin FROM chrome-ux-report... WHERE origin IN (a,b,c). To get all unknown URLs for a given origin, there is no equivalent queryable dataset. The only scenario I can imagine this info being provided is if the requester can verify permission from the webmaster. I saw that the FID metrics hab been recently added to the PSI reports. 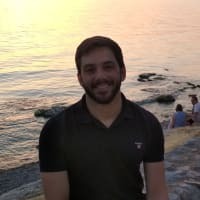 How can we access this new metric from the API ? I try to adapt the script in the google sheet exemple you gave tu us Rick but i need some help..
Hey! FID data is only available in v5 of the PageSpeed Insights API, and we have v4 hard-coded in the Apps Script. If i want to continue with this metric and keep history of it : i have to stay on the V4 version ? This was super insightful, thanks a lot for putting this all up here, Rick. One thing folks, make sure all the URLs are in lowercase — since DomainName like CamelCase in my case 🤣 didn't work on page insights. Yes and generally I'd recommend people plug their URLs into PageSpeed Insights as a first step to 1) see if it's supported by CrUX ("Unavailable" or not), and 2) resolve it to its canonical URL. 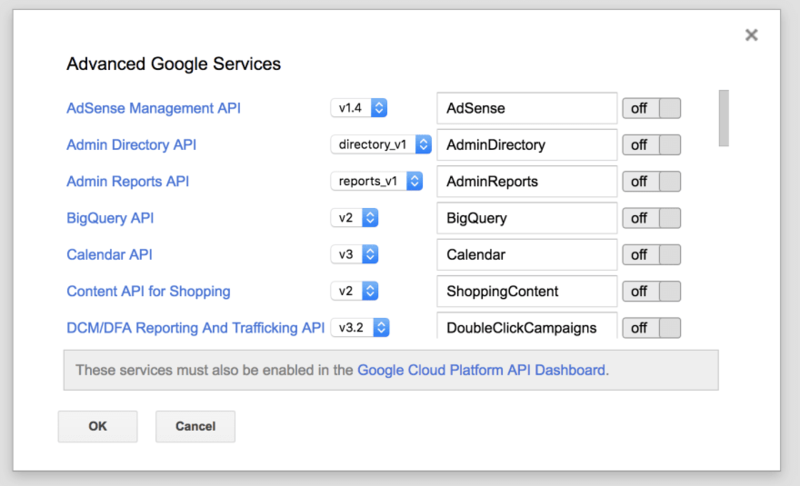 Then you can take that and plug it into BigQuery, Data Studio, or the PSI API with confidence. This has been awesome for me, but on 19/02/07 it stopped working on a few of the competitors I was tracking. For 5 of 12 to stop working overnight that can't be a coincidence, any ideas? 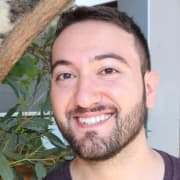 I am relatively new to Java but is it possible to get the rating (Fast,Average or Slow) as well as the median FCP and DCL for each of the origins? Like the one that is showing on the PSI web UI. When adding the PSI_API_KEY to script properties I can not fill in the API KEY, there is no field available to enter the KEY. Am I missing a step? Or I authorised the PSI API in the GCP. This is all amazing Rick! Thank you! Guys, how to do that comparison stats side-by-side for 2 domains in data studio? I'll share another post documenting how to do that. Thanks for reminding me. Hey Rick do you know if there are plans to provide First Input Delay data too via the Page Speed Insights API? Hi Rick, this is amazing. One question - Regarding the APP script, is it possible to get the FCP regardless of the form (mobile/desktop)?